I first saw the Grand Canyon the way many people see it; on a road trip. Traveling across the country from Providence to San Francisco, it seemed only prudent to make a stop at one of the world's most magnificent natural wonders. The canyon also happened to be nicely positioned between two other "world's best"; the tortillas at the Frontier Restaurant in Albuquerque, New Mexico, and the neon extravagance of Las Vegas, Nevada. Only one had I experienced before (the tortillas), and after the end of the trip, only two did I want to see again (sorry Vegas). My first impression of the multi-colored expanse of the canyon was a resounding "So this is it?" Even though I was definitely impressed, I couldn't stop thinking about how I felt like I was looking at a photograph, rather than actually standing at the South Rim. Maybe part of it was that I had driven right up to the place, a process which didn't allow any acclimation to the canyon's landscape, just an abrupt transition from civilization to nature. I decided to hike down into the canyon a bit to try and get a different perspective. After about half an hour, something clicked. I found myself staring across the many miles to the far side of the canyon, at the multiple rock layers sandwiched vertically atop each other. On my side of the canyon, I was standing where a dark jagged rock layer changed to a smoother, lighter layer. On the other side I found that same point, and my eyes scanned down the canyon wall from that point and observed how many more layers and vertical feet were left. It was at then that I grasped the magnitude of this place. I turned around and hiked back up the trail. I saw the grand canyon for the second time three years later, in a way that far fewer people get to see it; looking up from an inflatable raft. Whereas more than 5 million people visit the South Rim each year, less than 20,000 flow down through the canyon with the Colorado River. In addition to being one of this relative handful, I was lucky enough to be on vacation with my family and getting a crash course in geology and nature conservation at the same time. Our guided group of 5 rafts and 20 people put in at Lee's Ferry, only a few feet away from the official start of the Grand Canyon, and the only access point to the river until Phantom Ranch, where we would hike out of the canyon 90 miles downstream. At this point, the canyon is only a few hundred feet tall, and the river is level with the top layer of Grand Canyon rock, the Kaibab limestone formation. Formed 200 million years ago when an inland sea occupied the current location of the Southwest United States, it would be the youngest rock we would see on the trip. If my gaze at the canyon wall from the south rim was similar to looking at a timeline, with layers of increasingly older rock as the canyon descended, then going down the Colorado was like traveling backwards through time. In 90 miles, the Colorado only drops about 700 vertical feet, but the surrounding landscape is thrust up over 4000 feet. At Phantom Ranch the vertical distance between the river and the rim of the canyon is nearly a mile. Over this 90 miles of river, the rock abutting the water is constantly changing, and we had front row seats to the transformations. One common misconception about the formation of the grand canyon--one I shared before my trip--is that the river was once on level ground and eroded away at rock over millions of years until a mile deep canyon was formed. Part of this story is true, but part is not. Although it is widely accepted that the formation of the grand canyon took place over the past 5-10 million years, the landscape surrounding it was by no means constant during that time. Geological uplifts, caused by the force of continental plates pushing together where they meet at a fault line, caused deeper, older rock layers to be pushed upwards. Geologists think that some of these shifts may have even changed the direction of the river at times, or rerouted it. So the grandness of the canyon is a combination the massive erosion caused by the river, but also the change of the rock around it. The combination of these effects makes a trip down the Grand Canyon equivalent to traveling backwards 1.5 billion years in time; from the 200 million year old Kaibab to the ancient 1.7 billion year old Zoraster granite and Vishnu schist. 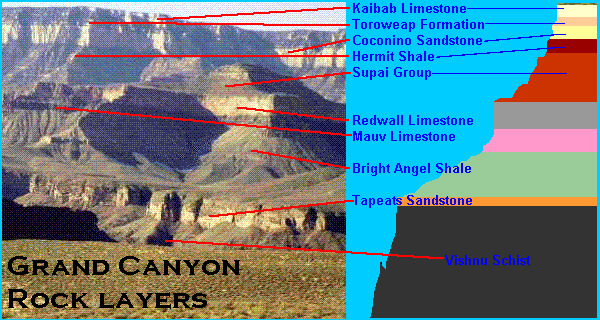 And just like many other scientific sequences, geologists have come up with a handy mnemonic to remember the layers: Know The Canyon's History, Study Rocks Made By Time. Kaibab limestone, Toroweap formation, Coconino sandstone, Hermit shale, Supai formation, Red Wall limestone, Muav limestone, Bright Angel shale and Tapeats sandstone. Where are Vishnu and Zoroaster you ask? Well I guess they just remember these because V and Z are at the end of the alphabet. Its a little abstract to try and comprehend the differences between these layers without being able to see them up close and feel them underfoot, but the important thing to grasp is that they are all extremely different from one another. Red Wall is sheer cliff, where Hermit is more sloping. Coconino and Tapeats are both sandstone, but the former is smooth and the latter looks like a stack of unevenly formed pancakes. Bright Angel is pretty boring until it is cracked open, revealing complicated layers of intense pinks, blues and grays, not unlike the surprise hidden within a geode rock. The overall sequence of these rock layers creates the classic tiered structure of the canyon produced by the combination of sheer and sloping layers. Traveling through the changing rock layers meant that the scenery was constantly shifting. It seemed like each mile we moved along the river, the canyon rim was visibly rising and a new rock layer emerging up from water level, soon to rise high above us making way for the next layer. Each night as we camped at the next spit of beach built up against the canyon wall, I marveled at how effective the national park service's regulations have been in keeping the canyon pristine. 20,000 may be a lot less than 5 million, but it is still a hefty sum of people to send down a river with only two points accessible by motor vehicle; one at the start, and one at the end 220 miles later. The strict "Pack in Pack out" rule (yeah, you guessed it) made the river seem largely undisturbed, almost as if we were the only people traveling down it. The only piece of trash we encountered the entire trip, was a small red caribener. The canyon is a much more controlled environment than it initially appears. The Glen Canyon Dam, 15 miles upstream of Lee's Ferry has transformed the dynamics of the Colorado, and in turn the canyon itself. The hydroelectric dam adjusts the flow rate of the river based on the electricity needs of Phoenix and Las Vegas. When the power demand is greater during the day, the turbine gates open to create a flow rate of 17,000 cubic feet per second (CFS), which is lowered to 9,000 CFS at night when the power demand drops. The result is an artificial tide along the beachy banks of the canyon, as well as the virtual elimination of flood waters. The water flow only becomes deregulated further away from the dam in the lower canyon, and only when there is rain in the drainage area of the canyon, one of the dryest places in the United States. No longer do meltwaters from the Rocky Mountains surge the river in the spring time. The dam creates another artificial situation as well. 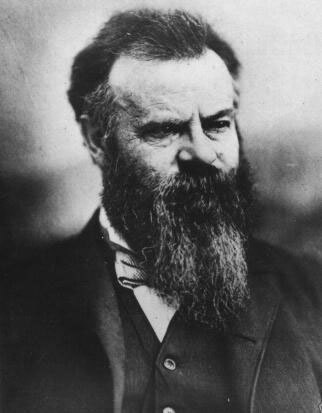 When John Wesley Powell first rode the Colorado and its rapids through the canyon as the first modern human to do so, the river was muddy and much warmer than it is today. Because the water in the canyon now comes from the cold bottom of Lake Powell, (the lake the dam created) it is clear of dirt particles and a chilly 48 degrees. Mankind could have done far worse to the natural beauty of the grand canyon, like building even more dams or relaxing regulations, but it is still complex to remember that the water we floated on over the entire 5 day trip was flowing more for Las Vegas than for us. The last day of the trip brought perhaps the most dramatic change in the rock around us. Although the canyon trip was a journey back through time, it skipped large chunks. A geologic unconformity occurs where a rock layer that should be there is missing. Scientists know the order of layers and how old each is because they have studied them in other locations. A rock layer can dissappear if it was somehow washed away at a point in prehistory. As the Tapeats layer transitions into the Vishnu schist near mile 80 of the river, there is a feature dubbed "The Great Unconformity." Why great? Because half a billion years of rock history are missing. The result is an incredible transition as dark, jagged and ancient looking rock suddenly rises up on both sides of the canyon. As we flowed into the dark rock, the river quickly became narrower, the flow faster, and the rapids much larger. The Vishnu is an explosion after staring at the rock in the upper layers of the canyon. It juts this way and that, with rock layered vertically rather than horizontally, and purple toned Zoroaster protruding through it. It kind of feels like one of those flying monkeys from the land of Oz could come swooping down at any moment. The presence of these layers seems to contradict the second law of thermodynamics; it seems like as the earth's crust has cooled over billions of years, the geologic features have increased their order, rather than the other way around. But then suddenly, around a bend two suspension bridges came into view, crossing the Colorado just above river level, and civilization once again dominated nature. We have arrived at Phantom Ranch. After an overnight in a log cabin with a flushing toilet(!) we woke up before dawn for the hike out of the canyon. If descending through the canyon on the river is like a slow motion rewind through the history of the Earth's crust, hiking up the Bright Angel Trail from the river up to the South Rim is like as fast forward back to the present day. All of my new friends were there to say goodbye; Tapeats, Hermit, Red Wall (although that part was steep! ), Coconino, the whole gang. Amazingly, my brothers and I managed to cover the entire nine miles of trail in just under 4 hours, managing to beat the hot desert sun and midday heat. When we emerged from the canyon I found myself standing at nearly the same place that I had stared across the canyon three years before, feeling like only now did I truly understand the adjective applied to this place.